A Mandarin dragon is etched into a pendant of serpentine to grace this dramatic necklace. The mythical creature stands watch to protect a bevy of colorful gemstones. 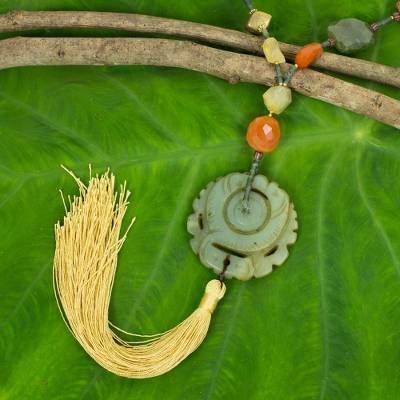 By Saranarat in Thailand, this original jewelry design showcases carnelian, rutile quartz, and calcite along with aventurine and citrine. Diminutive brass spacers and crystalline glass beads also appear. A jaunty tassel adorns the pendant and the necklace closes with a sterling silver clasp bathed in 18k gold. This necklace exceeded my expectations! When I opened the box, I was struck by the beauty of the individual stones and the carved dragon motif disc. I look forward to wearing it with a simple black dress.